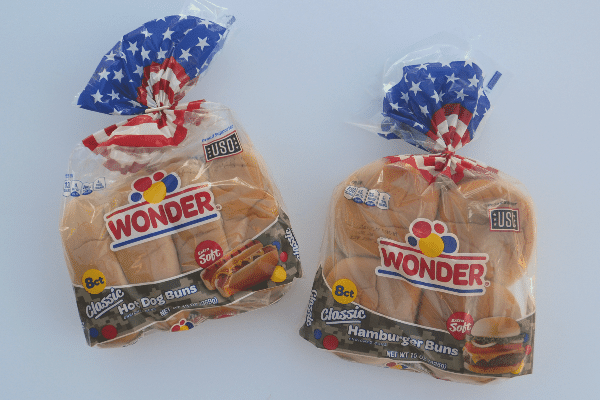 Special thanks to Wonder for sponsoring today’s post and for partnering with the USO to support our military members. 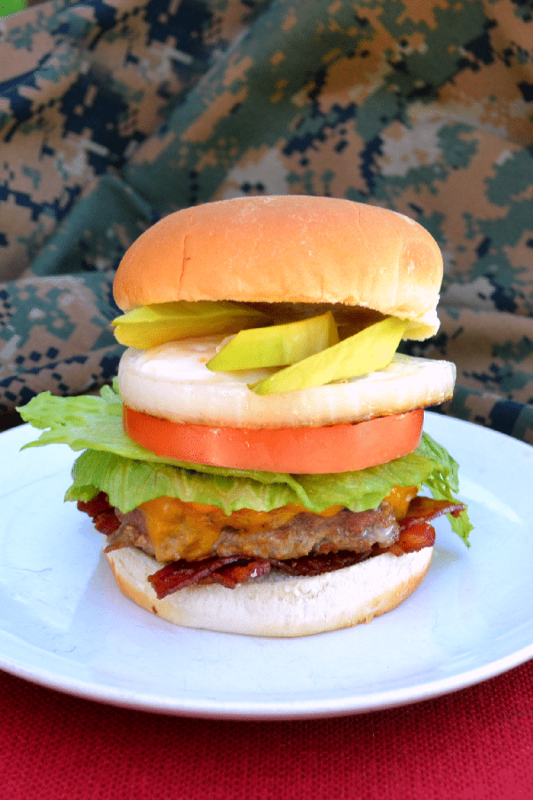 Years ago my husband came back from a deployment to Okinawa raving about the USO burgers. He couldn’t wait to make them for me and now, years later, they are one of my kids’ favorite meals! For those who don’t know, USO stands for United Services Organization. It’s a non-profit organization that supports the U.S. military and their families in a number of ways, including operating centers near military installations and in airports to provide hospitality. It was at the Camp Schwab USO in Okinawa where my husband first enjoyed what he refers to as either USO Burgers or Man Burgers, depending on his mood and who he’s talking to. My husband loves the USO burgers because he feels like he gets breakfast, lunch, and dinner in one meal. These are mega burgers, loaded up with lots of extras. 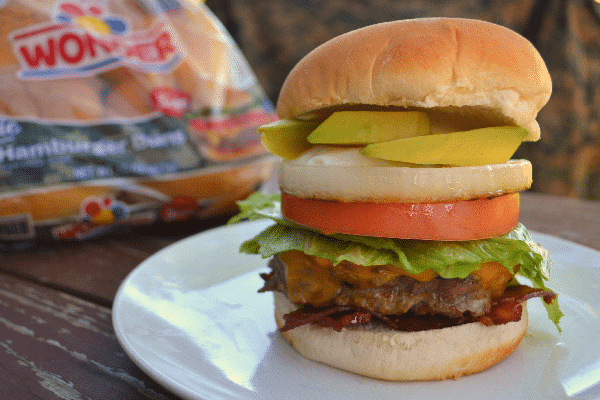 Skip the side dishes when you make these burgers because the burgers are a meal in themselves! 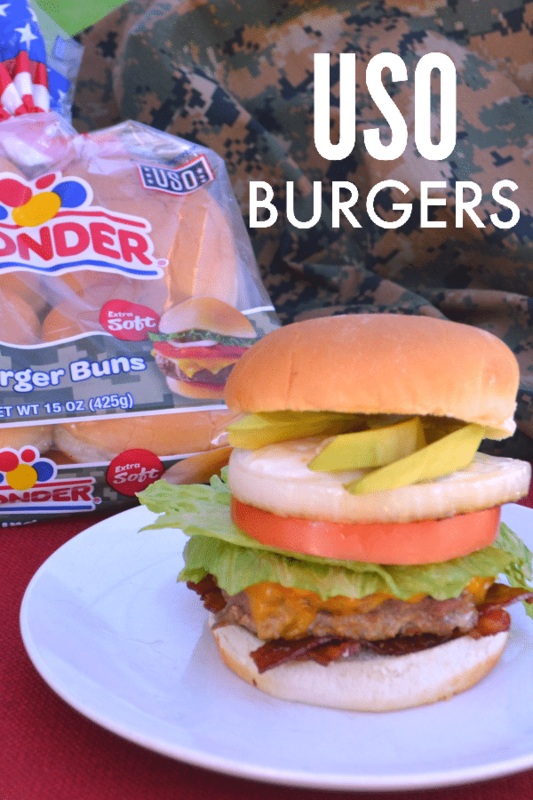 When I saw the “Camo for a Cause” packaging on the Wonder hamburger and hot dog buns, I realized it was time for me to share this family favorite recipe. I mean, there it was — USO hamburger buns! It’s almost like Wonder and the USO got together to compel me to share the USO burgers recipe. Actually, Wonder and the USO partnered on the “Camo for a Cause” campaign to honor the service of military men and women. I love the camo on the packaging. Such a simple, visual way to send a supportive message! And, as it turns out, the perfect inspiration for me to share my husband’s favorite burger recipe. For some reason, the epic magnitude of these burgers wasn’t quite enough for my husband. Over the years, he’s slowly added nuances to make his version of USO burgers even more special. These nuances are the things my kids love best about USO burgers. We always make the patties ourselves. And by we, I mean my husband, since this is his go-to meal when he volunteers to take dinner duty. Originally, he would season the hamburger with salt, pepper and garlic powder. A couple of years ago he started adding Montreal steak seasoning and the family agreed this was an improvement. 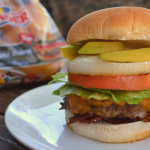 Because the burger is stacked quite high by the time all of the ingredients are piled on, my husband started experimenting with ways to make the layers more stable. He had a stroke of genius when it came to the bacon. It’s almost impossible to eat a USO burger without a piece of bacon sliding out the side. So, my husband decided to weave the bacon together before cooking it to create a bacon blanket that sits nice and flat on the burger. And more importantly, holds the bacon pieces together so you don’t lose any of that salty goodness while you eat the burger. The fried egg was also a frequent casualty during dinner. 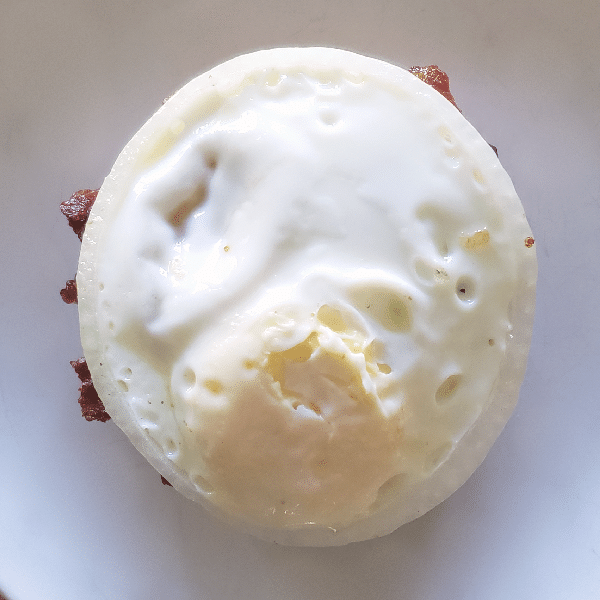 As you’ve probably noticed, fried eggs can be pretty slippery, which meant they are always trying to slide off the USO burger. My husband solved this dilemma by using a large ring of fresh onion to contain the egg. He slices the onion, sets it on the griddle (or in the skillet) and cracks the egg into the center. The egg might still be slippery, but the onion tends to hold its position on the burger. Look at how perfectly sized it is for the burger! Avocado is one of those foods we love so much that we try to put it on everything. USO burgers were the perfect home for it so they are naturally included in our version, even though they weren’t on the original in Okinawa. 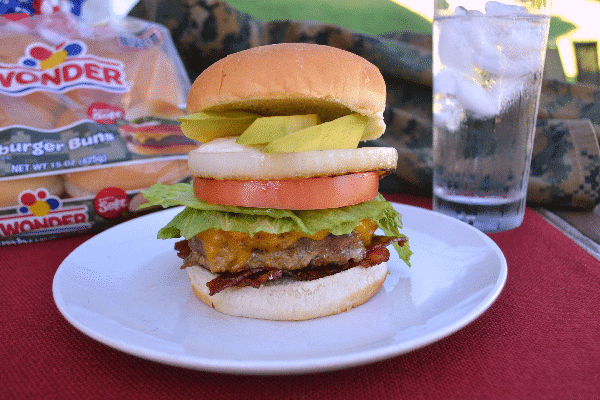 Ready to cook up your own homemade USO Burgers? Here are the detailed measurements and directions. Enjoy! Combine ground beef, steak seasoning (OR 1 tsp each of salt, pepper and garlic powder) and egg in large bowl. Using your hands, mix together and shape into 4 hamburger patties. Set aside. Lay out 4 open Wonder hamburger buns on a large platter or individual plates. Add desired condiments to each bun. Set aside. Cut bacon slices in half. Take 3 bacon strip halves and lay them side by side on a griddle. Take 3 more bacon strip halves and create a square, weaving the new pieces alternately over and under each of the 3 pieces laying on the griddle. 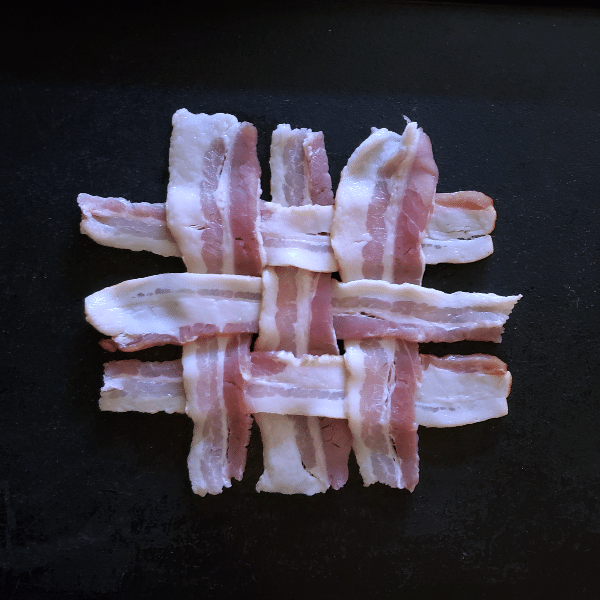 Repeat 3 more times to create a total of 4 bacon weaves. Turn on griddle and cook bacon weaves for several minutes until edges are just starting to brown, then carefully flip each bacon weave. If you flip too soon, the weave may fall apart. Cook an additional few minutes until bacon reaches desired crispness. Remove to a paper towel-lined plate to cool. Then place one bacon weave on each hamburger bun bottom. Cook hamburger patties on a grill or griddle over medium-high heat. Just before meat is cooked to desired doneness, top each patty with a slice of cheese. When cheese is melted, place each hamburger patty on top of a bacon weave on each bun. If desired, add jalapenos to the top of each hamburger patty. Next, add lettuce and tomato slices. Slice onion into rings that are approximately 1/2-inch thick. Remove inner rings and set aside. 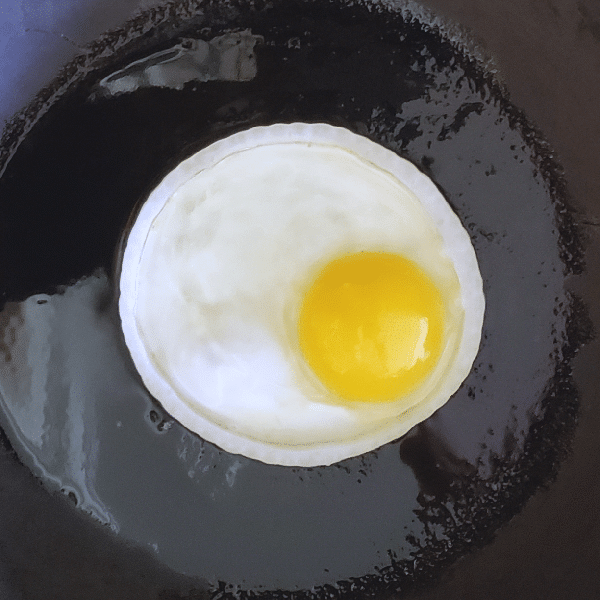 Place 4 rings on the griddle and crack one egg into each one. Cook over medium heat until cooked through. Place each onion-ringed egg on top of a tomato slice. If desired, add sliced avocado on top of each egg. Then, put the top of the bun in place and serve! This looks delicious! I agree two meals (breakfast and lunch) in one!